Progress in the Northern Ireland peace process has been delayed by rows over what is arguably a phoney 'culture war'. In the second of a special three part series using infographics to challenge political stalemate, The Detail's Steven McCaffery illustrates how two of the biggest stumbling blocks to a new future are founded on misunderstanding and political spin. WHEN it comes to politics, both unionists and nationalists have long, if selective, memories. Politicians in particular are happier to pull the historical threads that tie-in with their own electoral needs. The recurring battles over loyal order parades and around the Irish language are good examples. Depending on who you ask, parading has been a hot topic since the Drumcree stand-off of 1995, or since the Lord Lieutenant of Ireland warned of the dangers of political parading in 1839. Today there are repeated disputes over the decisions of the government-appointed Parades Commission. It has adjudicated over marches since the infamous long-hot-summers of the 1990s when parades became the focus of mass violence between nationalists and unionists. Many of the most tense episodes in that period centred on the Drumcree stand-off in Portadown, where Orangemen were rerouted away from the nationalist Garvaghy Road. But, for all the controversy, the Parades Commission is nothing new. In 1857 government commissioners concluded that 'Orange’ events led to "violence, outrage, religious animosities, hatred between the classes and, too often, bloodshed and loss of life". Even the outbreak of the Troubles was sign-posted by unionist parades, as well as Civil Rights marches. Parades and opposition to them have routinely been the weapons with which this society battled for political advantage. But that isn’t the whole story either, because for many families the marching tradition is a beloved part of life that links the generations. Such members of the loyal orders are angered to see the reputation of their institutions damaged by incendiary incidents. The climate around parading has improved hugely over the last 20 years, including at Drumcree, where the heat has gone out of the issue. The parade flashpoints that do still exist have come to dominate the headlines and have led some unionists to claim that their culture is being stamped out. But the facts suggest the opposite, pointing to a positive picture for Orangemen and other unionist marchers. And even for those nationalists who see red when an Orange banner flutters into view, there is evidence that in most areas, the parading tradition continues unhindered. Parading is still at the centre of tense stand-offs in a handful of locations, most notably at the Ardoyne area of north Belfast. Since restrictions were placed on loyal order parades past the nationalist district, protests by groups representing the broad Protestant, Unionist, Loyalist (PUL) community have developed. But north Belfast is also one of the areas worst affected by the Troubles and it has not felt the financial benefits of the peace process. Violence by dissident republicans opposed to the peace process is a further feature. North Belfast is also the scene of a tight political contest between the DUP and Sinn Féin. The two political parties agreed to the reform of the parading system at the Hillsborough Talks of 2010, but that deal was later rejected by the Orange Order. Since then, talks in 2013 led by US diplomat Richard Haass, and the most recent Stormont House talks of 2014, have failed to reach agreement on parades. Meanwhile, the main unionist and loyalist political parties joined forces in Belfast with the Orange Order to campaign against what they characterised as the failure to accommodate their parading tradition. But, as our infographics show, official figures for the last decade tell a different story. 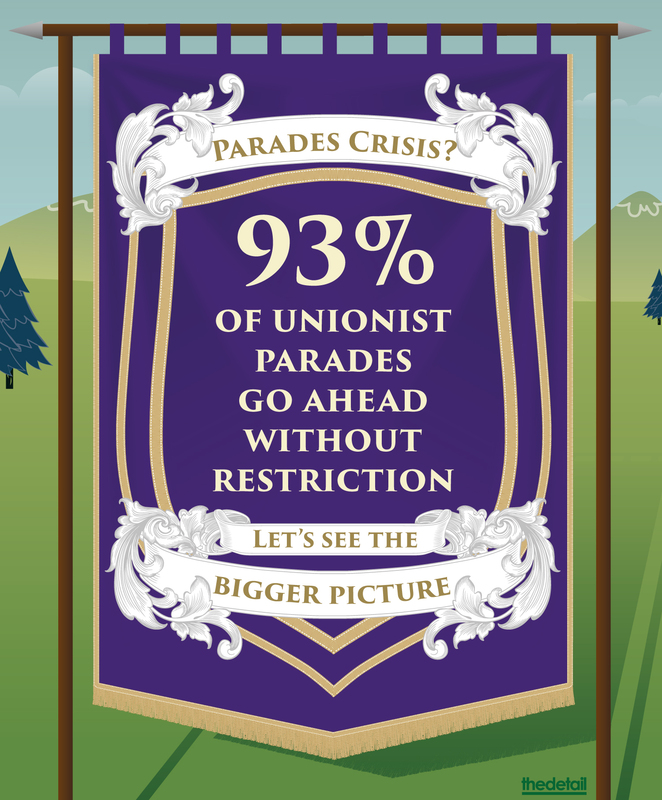 On average each year 93% of all unionist parades went ahead without restriction. If the continuing Drumcree and North Belfast stand-offs were removed from the equation, the figure rose to just over 95% of unionist parades going ahead without restriction. It is also worth noting that of the fraction of marches that were restricted, only a portion of those were rerouted. Restrictions are often limited to conditions such as the timing of a march or the music played. On the basis of the latest published figures covering 2004 to March 2014, unionist groups had around 26,000 parades over that decade. That tells a positive story for marchers across Northern Ireland. So is the 'crisis' in parading, or in politics? It is a political reality that through recent history the Irish language has become associated with Irish nationalism. But increasingly, the language is finding its own independent voice. All too often we’re reminded that the IRA’s battle cry was the Irish phrase 'Tiocfaidh ár lá'. Alternatively it has been noted that the loyalist Red Hand Commando paramilitary group used the gaeilge slogan, `Lámh Dhearg Abú’. But if that is all you know, then your experience has been restricted to the worst excesses of the use of the language. Irish is a living language that is all around us – with 95% of older place-names in Northern Ireland originating from Irish. The loyalist heartland of the Shankill Road is one example – ‘Seanchill’ was the gaeilge name that noted the presence of an historic church in the district. Past and present students of Queen's University in Belfast will know the surrounding area of Stranmillis, or to use its original Irish name, 'An Sruthán Milis', the sweet stream. Thousands of children are now taught through the medium of Irish. The 2011 Northern Ireland census showed that close to 11% of the population had some knowledge of the language. In Scotland the census figure for gaelic speaking is 2%, (though a separate sample survey suggested 13% had some ability), while in Wales the number of speakers is put at 19%, with 27% having some ability. Scotland and Wales have language acts to protect, promote and celebrate their languages. There is no similar legislation for Northern Ireland, as unionist politicians see nationalist calls for promotion of Irish as a threat to their British identity. But despite the political controversy, the celtic tongues bind the peoples of these islands. Irish is a language with cross-community links that stretch back through the centuries. Members of the Protestant community were instrumental in preserving gaeilge in Ulster in the 1800s. Historically, both the Orange Order and the Ulster Unionist Party used the gaeilge language. The now renowned Irish language group in predominantly unionist east Belfast, Turas, is credited with sparking a revival, even a reclaiming, of the language by the Protestant community in that part of the city. Other campaigners have spent decades helping to inject a vibrancy into the Irish language scene in the north of Ireland. Politicians remain divided on the language. The failure to agree an overarching policy at Stormont has sparked a free-for-all of policy decisions on local councils. 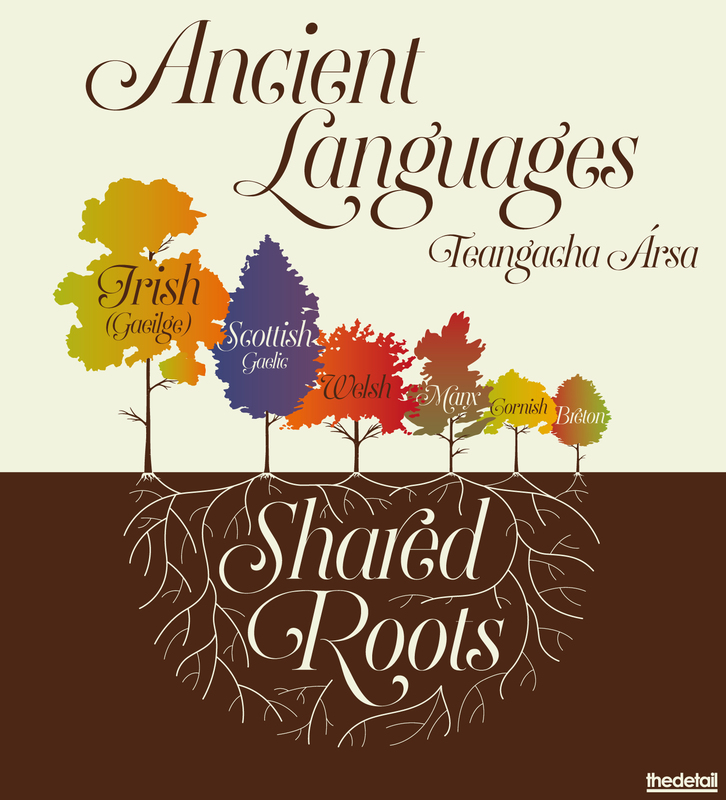 But Irish has shared roots and it is a language that is branching out and finding new expression today. On both the issues of parades and language, the world of politics would have us believe there is a cultural war. It would be foolish to say tensions do not exist between communities on issues of culture and identity, but the data and history suggest compromise should be within reach. If the politics was taken out of these issues, we might have time to get to grips with other much bigger problems. Imaging NI - Part 3: Dealing with the legacy of the Troubles and divisions in education. NI's next big test.